There are an estimated 900,000,000 unique visitors accessing Facebook every month, according to eBizMBA. That being said, not having an account for your snow removal business is not up for debate. Your customers and potential new customers are on social media, so that’s where you should be. By using social media, it allows you to provide exceptional, and often, instant customer service as well as humanize your business. And since social media is a natural extension of search, having an active Facebook account, as well as a few other social sites, improves your presence and “search ability” on the internet. Use this article as a guide to maintaining a strong, effective social presence for your snow contracting business. 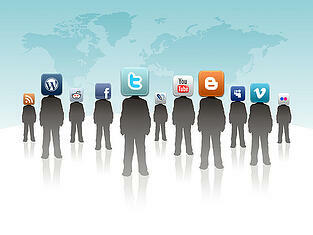 We’ll start by taking a closer look at the main social sites that you may want to consider for your business. Facebook, Twitter, LinkedIn and Google+ are currently the four major players. Facebook: Facebook, being the dominant social media player and having a high volume of traffic, is a great way to present your services to a large number of people and post a variety of media content. You can post pictures, videos, polls, special offers and event information. The goal with your page should be to engage with your current and potential customers and share information that is relevant to your area of expertise (i.e. snow removal). You could share safety tips about any number of topics including safe winter driving tips or alerting viewers of icy road conditions. You could post a picture of your fleet before a storm and let your customers know that you’re ready to take it on. The possibilities are endless. Twitter: With a 140 character limit per tweet, Twitter is more casual and not always the best platform for long text posts. It’s best for short content, pictures and linking back to either your website, Facebook page or any other content that you want to share. Twitter is wonderful for rapid updates to promote content, events and monitor what people are saying about you with the use of hashtags. Hashtags are a way to tag tweets and funnel the conversation around a topic or event and makes it searchable for any Twitter user. Hashtags that would be relevant to you would most likely be hashtags like, #snow, #cold, #ice, #snowplow, any hashtags about winter storms, etc. Many conferences and tradeshows create specific hashtags for the events. If you’re attending, you can use those hashtags too. LinkedIn: For a more professional platform, head over to LinkedIn. LinkedIn is a place for professional people and businesses to network and showcase their accomplishments and knowledge. You can connect with others in the industry and share knowledge by using a business and a personal account. LinkedIn also allows users to review products and services. You can then collect these first hand testimonials and put them on your products and services page tab on your account for everyone to read, providing a great source of word of mouth promotion. LinkedIn also provides a great resource for educational content to help you develop as a professional/business owner. Whether you are looking for information on marketing your business, assistance on managing your staff or information on trends in the snow and ice industry, LinkedIn is an excellent place to stay up to date. Google+: Google Plus is often underestimated, but Google+ can be a valuable business tool for several reasons. It is similar to Facebook in that you can connect with people and share a wide variety of content, however, its most valuable feature is that it is integrated with many Google products including Google search and YouTube, increasing the chances of your business getting found through search. SEO, or Search Engine Optimization, is how you improve your rank in the browser’s search index, whether that be Google, Bing or Yahoo. If you aren’t well indexed on search engines, or more simply put, if you are not showing up on the first page of the search engines, you are missing out on innumerable opportunities for people to view your page or read your content. Whenever someone has a question, it is becoming more common to just say “Google it.” This is also true for snow removal services and you want to be on the top of the list. You don’t need to be on all social media platforms, but definitely try setting up one to start. Where should you start? It is important to find where your target audience is. You don’t want to waste time and precious content on places where your audience won’t see it. Test it out and see which social platforms are most effective. Set some goals, be patient and get ready to create some great content. Keep your eye out for Part 2 of this article!